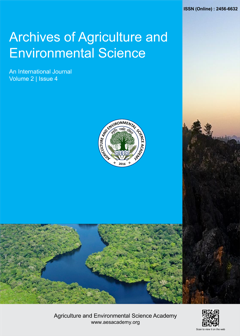 The journal Archives of Agriculture and Environmental Science (AAES) is a peer-reviewed, multi-disciplinary, open access International Journal that provides rapid publication (on quarterly basis) of original research articles, review articles, short communications and case study. It publishes research papers in all areas of Agricultural and Environmental Sciences. All papers are subjected to peer review by members of the editorial board or qualified reviewers by the use of single blind peer review system. Agriculture and Environmental Science Academy (AESA) is registered under the societies registration Act XXI of 1860 with its head office in Haridwar (Uttarakhand), India. AESA is a not-for-profit organization and is an interdisciplinary research organization and it’s dedicated for issues in the field of social, environment and agriculture development. We provide standard way for readers to locate the authenticated version their articles and a DOI number. We evaluate the scientific, academic and professional work by scientists working in the same research field. We give a "Best Article Award" to honor the author(s) of best article published in each issue. Plagiarism is strictly restricted in the journal AAES. We follow Plagiarism Policy for quality publication. Know more. All the work published is licensed under a Creative Commons Attribution 4.0 International License. We provide a 100% uptime server for 24x7 availability of all contents on our website. Give an attractive and error free professional look to your paper with our standard format. We have adopted an Open Access policy for unrestricted access and reuse of all peer-reviewed published research. This website is best viewed in a modern browser like Google Chrome/Mozilla Firefox/Opera/IE11.